Southern batters are almost always moistened with buttermilk. Northern cornbreads usually call for 'sweet milk' (i.e. regular, non-buttermilk milk). Since I am on a buttermilk roll, I chose to use buttermilk even though the recipe is a northern one. Grease a 7x11 or 8x8 pan with cooking spray. Melt 1/3 cup butter and put aside. Mix wet ingredients into dry and combine them quickly. This is a delicious cornbread, and I'm serving it with Gladys Taber's Leek Soup. When a waitress leaves the restaurant or changes her schedule, her customers feel it the most. Virginia Brandon, who worked days at the Rainbow in Henderson, Nevada, for thirteen years said, "The regulars eat the same thing everyday. I'd see them come in, I'd hang their ticket. By the time they'd sit, I'd put the plate down in front of them." Perhaps you have seen the name Elspeth Thompson on my 'over the oceans' bloglist. She had also just begun a new one which I added to 'mostly gardens' called Gardening Against the Odds. If you visit either of her blogs this day, you will find the saddest news written by her husband: for Elspeth Thompson is dead. She lived a life that seemed so full of joy and beauty. I shall sorely miss her words. I'm so very sorry for her family and her friends. There is an obituary here. And a beautiful tribute here. Borrowing from Garrison Keillor, it's been a quiet week at Windy Poplars Farm. No farm animal exploits to report on. Nothing happening in the garden. Monday, March 22 I heard the woodcock for the first time this spring. The holy bird trio have now all arrived. I haven't heard the redwing, but Tom is quite sure he did one morning. They aren't regular visitors to our land anyway since I think they like wetter areas. We see and hear them only occasionally here. We had a little snowfall to begin the week, but it never landed, and by afternoon the sun was out again. Tuesday night into Wednesday morning we got maybe an inch of snow. Wednesday was cool and cloudy so it stayed on the lawns, though not the road. And then that melted too. The temps have been cool and there's been March wind, but sunny and bright. Today there was a bird on the wire outside the laundry room that we have never seen before. The bird book description makes us think it is a kestrel. So exciting! It used to be known as a Sparrow Hawk because, sadly, it likes to eat one of my favorite little birds. 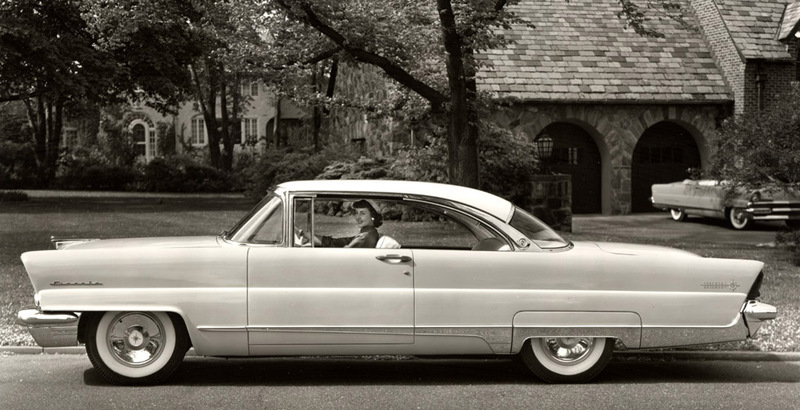 Hop in this great old car, and we'll sally forth to some interesting places I've come across this week. You may learn what the Saturday Sally idea is all about here; and for other Sallies you may look on the sidebar under Letter Topics. My first stop is a fantastic weekly event at Karen's blog called 'Seen on the Subway.' She notes readers and books she has observed while riding the New York City subway. I am fascinated by these little vignettes and think you will be too. If you haven't read Sharon Lovejoy's books, or haven't seen her blog, please visit Little Acorn Learning and read a wonderfully detailed interview with her. You will enjoy meeting Sharon if you haven't, and will learn more if you already know her. A really tremendous piece with great pictures, too. 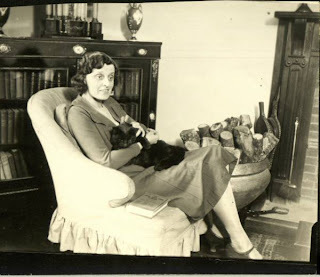 If you are an Agatha Christie fan, or if you want to know more about her books, there's a fun and informative blog called, fittingly, The Agatha Christie Reader. The explanation about it is here. The sidebar offers such categories as the various decades, country house, poison, etc. giving the reader an easy way to explore Christie's work. In this book, all the local men are visiting the 'witch' ostensibly for indigestion problems. She concocts herbal remedies for them. But it turns out what they are really receiving is something to make them more 'attractive' to their wives. They end up getting sick from her cures. And then she is found murdered and her house is burned down. We learn she has left a trail of people who hate her. Hamish hopes against hope that the killer will not be one of the locals. He loves his village and his villagers even if they are flawed as human beings. He accepts them for who they are. Rare quality in a rare man. Death of a Witch includes some disturbing events which made me cringe a bit but there is always humor in these books to help lighten the troubles. The epilogue is particularly zany as Hamish goes on a holiday won by his mother. The weather and the landscape are, as they say, characters themselves in this series. A small sun was shining through a thin veil of mist when Hamish returned to Lochdubh, creating that odd white light so typical in the north of Scotland. In the Highlands of Scotland it's possible to get three climates in one day. Oban was a pretty place in summer but as he drove down to the waterfront, a gale was whipping across the harbour. The thaw came quickly the following day, only to be followed by a sharp frost turning the roads treacherous. Granger had fallen into a peat bog. "I'm sinking." 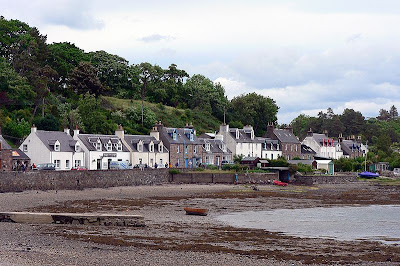 This is the village of Plockton which was 'Lochdubh' in the television series of Hamish Macbeth. No wonder the policeman is so content to be there despite the occasional unpleasantness of murder! Add buttermilk alternately with flour mixture. Bake in a greased 13 x 9 inch pan for about 45 minutes. Blend one pint of heavy cream with 1/4 cup confectioners sugar and a dash of salt in a blender for about a minute until cream is thick. Of course you could instead use a cream cheese or sour cream or buttercream frosting. It's going to taste great with any of them. This is an exceptionally light and fluffy cake! Delicious! In honor of Stephen Sondheim's 80th birthday - Send in the Clowns from A Little Night Music. 'Beware the Ides of March' indeed! In the morning, Margaret stopped by with her dog, Lexi. Lexi is a wonderful mixed breed dog who can jump over anything. Well, this day she jumped the four foot high electric fence into the pasture. I awoke to Daisy hee-hawing and Margaret screaming. You see, the reason we keep donkeys is that they are terrific protectors of sheep. We had heard of a donkey in a nearby town who grabbed a dog by the scruff of the neck and threw him out of 'her' pasture. Finally, Margaret got Lexi out. But during the fracas, Daisy had slipped and fallen on the ice. She's an old girl- 28 in June, and we were concerned, but she seems fine. As does the sweet dog. You may remember an appearance on the blog in December. The daylilies have popped up on the south side of the house. On Wednesday there was another little farm adventure. After Tom had done chores and closed the barn door for the night, there were two chickens outside. They had gotten out through a space in the fence, which is now repaired. Isn't the evening light just beautiful? So I opened the door, and they began hustling into the barn. Except this hen who decided to go the other way. She ended up going back just the way she came. These chickens live in the whole barn with the donkey, sheep, and goats. They don't have a separate coop except when we get new chicks, who stay in there for a while before being let in with the older chickens. For the first time since October it has been warm enough to let the woodstove die a few nights this week. This morning we saw robins on the lawn for the first time! How did they know it is the first day of spring?? I have never used buttermilk in baking. This is probably surprising to many bakers, but honestly the only stuff I ever saw in the stores had artificial ingredients, which I try to stay away from. Well, the other day I saw on the shelf some buttermilk from Butterworks Farm in Vermont, the same company which sells the heavy cream I use exclusively. The ingredients in this buttermilk are pasteurized nonfat milk and active cultures. Period. Here is my first recipe using this buttermilk, and it won't be the last! These pancakes are the best we've ever, ever tasted. I'm thinking I might make them once a week. Keep the two mixtures separate until you are ready to cook. Heat a lightly oiled griddle or frying pan (I used my new griddle) to medium high heat. Pour milk mixture into dry mixture, using a wooden spoon or fork to blend. Stir until it is just blended together. Pour or scoop the batter onto the griddle, using about 1/3 cup for each pancake. The recipe made ten pancakes; four for Tom, three for me, and three for Ben and Sadie! On this last full day of winter, Mrs Bale wanted to stop by to tell you that it has been a really wonderful winter around here. While the rest of the state, the country, and the world got snow, snow, snow, we did not. I don't keep records, but I think the last big snow was in the teens of January. When Mrs B told you about the January thaw, she didn't realize it was really the end of wintery weather. We've had a couple of little whirling snows, but nothing has lasted, and we've had lots of bare ground for weeks. And the sun. It seems to me that almost every day in February had some sunshine. Even if it was cloudy most of the day, it was sunny for a while. And March hasn't been much different. A bit cloudier, some wind, a little rain. But it has felt like we've been in a little springy bubble that kept the usual winter weather away this year. Happily, it has stayed cold enough so the ski areas could make snow. As winter makes its last appearance today, it is sunny and bright and almost 60º. Mrs Bale and I aren't complaining one little bit. Well, the lady is definitely not gentle.The word just happens to be her last name, the name of the man who married her when she was a hatcheck girl. Everyone in the area of Hamish Macbeth's little town of Lochdubh thinks she is a wonderful little old lady; everyone, that is, except Hamish. He doesn't like her. And of course the reader very soon agrees with him. She is cruel to her children and cruel to her servants. And also, of course, she is soon dead. She is not the only corpse. The second one is a woman from Turkey whom Hamish had planned to marry to save her from being sent home, and to save his police station from closing. Lucky for Hamish she dies before the wedding since it turns out she was lying to him; she was really a high class 'lady of the night' from Russia. There are many times in the story when Hamish notes how much he loves this village. The small town policeman who is truly content to be where he is. No matter how light and fluffy the mysteries are, I'm so fond of Hamish that I just don't care. He is a wonderful character. His home, which is in the police station, feels so cozy and comfortable and welcoming with his dog and his cat. It isn't absolutely essential you read these books in order. I know I've missed a couple, but the author catches us up pretty easily. After all, not much changes in Hamish's life other than the murder victim, and that's just the way he likes it. And me too. I've been mulling over an idea for a while, and yesterday morning it became clear what I wanted to do as I read a post on Des Kennedy's book at Kiirstin's blog. I would like to document in a more serious way the life at Windy Poplars Farm. As you know, we aren't a working farm. The animals who live here, live here until they die. The only product we sell are eggs. And the money just about pays for the chicken feed, at least some months. Our animals are here because we love having them, and because their grazing stops this place from turning into woods. Our donkey, six sheep, and two goats keep us in green pastures. They also give great peace and contentment to Tom when he gets home from a busy day of teaching. And then there are the gardens, both flower and vegetable. I post a lot of pictures, mostly in the summer. I take an occasional Sunday Stroll. But I want to pay more attention. I want to notice the way things change and the way they stay the same. I'd like to think I'll do this every year, but I'll begin with one year and see how it goes. I'm going to start on the first day of spring, which begins in my time zone on March 20 at 1:32 pm. Because that is a Saturday, I hope to write my Farm and Garden Weekly each Saturday thereafter. This is a series in which the characters do grow and change as the books go on. When we first met Carole and Jude they were pretty much stereotypes: Carole - the well-controlled, tidy, retired civil servant, and Jude - the free-spirit, alternative therapist, with an unknown past. By this, the seventh in the series, they have moved out of their rigid roles, and each of them bends a bit in understanding the other. They are neighbors in the south coast town of Fethering, England. They have become quite close friends and partners in solving crimes of murder. The murder in this book is of a man who used to be quite a famous horseback rider until a fall from a horse stopped his career. For the past several years, he and his wife have run a boarding facility for horses. They don't have much money and their place is falling down around them. They have to put up with fussy, demanding, sometimes aggressive clients to pay the bills. When Jude finds his body, we discover that there are many secrets in this 'horsey' world. The mystery was quite satisfying, and I did enjoy spending time with these two women again. Now, a caveat. There is a subplot involving cruelty to horses. I'm the first one to run a mile when I see such a thing in books, but it was mentioned maybe five or six times, and I moved my eyes right along so I didn't read the details. It does connect in the end to the murder. I think a lot of people who don't read cozy mysteries think that they are quite mild and even humorous. Well, that can be true. But they can also offer sordid facts about individual characters. After all, murder is not pretty even in a cozy. There is a particularly awful man in this book whose actions are appalling. Each book in the series spotlights a different facet of life, such as modern pubs in England or the New Age movement. This one focuses on the seedier aspects of the rural rich and horses. I did enjoy it. I stayed up till 2 am last night to finish, though there is the abuse factor which made it more difficult for me. My father, in middle age, falls in love with a dog. who drank martinis to make his mind quiet. than the rough tweed of his presence. come home to made young again. one of us has mistaken her for a person. restaurant when she was nineteen. a dog. What can I do but be happy for him? Oh, the books that have been coming into my house lately! Murder is Binding by Lorna Barrett - first in a series set in a fictional New Hampshire town of bookstores; picked up right after reading Kay's review. The Stabbing in the Stables by Simon Brett - I can't seem to resist Jude and Carole. I've read the previous ones, and wanted to catch up. Death of a Gentle Lady by M.C. Beaton - the next one after Death of a Maid which I recently wrote about. And a police procedural (I think that's the right classification) - Orchestrated Death by Cynthia Harrod-Eagles, first in the Inspector Bill Slider series. I read this years and years ago, and have meant to carry on with the series. It has been so long now that I wanted to read this first one again before continuing. The Tales of Maudie Tipstaff by Margaret Forster. I read this ages ago, and remember liking it. A woman goes off to visit her adult children. Doesn't she have a great name?! addendum: not a cozy mystery, but fiction. Major Pettigrew's Last Stand by Helen Simonson- irresistible after reading raidergirl's review . 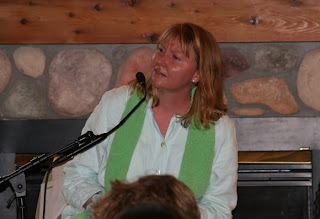 Queen of the Road by Doreen Orion - have been thinking about since Heather's review. The Uncommon Reader by Alan Bennett - I've read many, many great reviews of this. 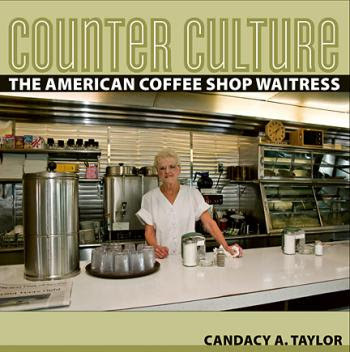 Counter Culture: The American Coffee Shop Waitress by Candacy A. Taylor - sounded wonderful after hearing about on National Public Radio. The Provincial Lady in America by E.M. Delafield - one I haven't read about one of my favorite fictional characters. Dog On It by Spencer Quinn - a mystery narrated by a dog. Sounds like great fun. Frangipani by Célestine Vaite - I was captivated by the cover and description as I wandered my local bookstore. All these books plus the Inter Library Loan biography on the sidebar, and the one I had to put aside to read it. Will I read them all? I hope so, but I'm not a fast reader, and spring is coming, and I am on the six-movies-out-at-a-time plan at Netflix, and I have several other books on order from the library, and on and on. But they are so very appealing. Now I must shut off my computer and head to a reading chair. 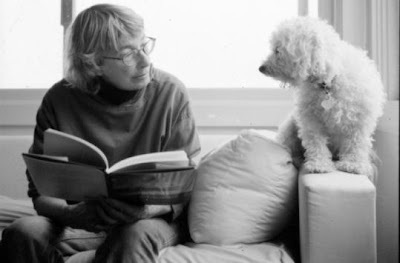 Mary Oliver, from Red Bird, 2008. This is the most beautiful book I own. What a lovely idea to put together Beatrix Potter's words with facsimiles of diary entries, letters, cards, and drawings. This is a most wonderful book, and I highly recommend buying it for your own collection. It begins in 1882 when Beatrix began her diary, and it goes right through to her time in the Lake District when she marries William Heelis in 1913. Each page is full of images that relate to each other. When she says, 'At last I have a success to report. I decided that I should make a grand effort in the way of Christmas cards,' we see those cards. When she writes of Mr. Warne's nieces, we see their photograph. And it looks like a real scrapbook, being 11 1/2 by 10 inches in size. It is most appealing to the eye, and informative about the author. It is simply a treasure. I first heard of this book from Heidi and then I read about it on Janice's blog. This is my third book for the You've Got Mail Reading Challenge. 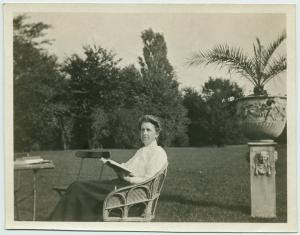 More about Beatrix Potter at Letters from a Hill Farm here. It strikes me that I have a couple of quirks. 'Oh, just two, I beg to differ,' say all who know me. I've had two odd reading experiences in a row. I don't need to mention the titles since the authors are alive. The first one was a biography. I think perhaps not too much is known about the subject, and often the author would say 'may' or 'probably' about various incidents. For example the person 'may' have seen a particular movie that night. I couldn't stand it. I know that biographers don't know all the facts, but I'd rather the author limit the book to what is known. The other book was a memoir and it was written in the present tense. Is that the right term? Something like, 'Nan and I are eating our dinner of potatoes and carrots.' I would rather read, 'Nan and I ate a dinner of potatoes and carrots.' Tom told me this is a common way of writing, but I sure don't like it. I don't even like an oral story told to me that way. If it happened in the past, I like to see or hear the past tense. So there you have two quirks of Nan. The back and front cover illustrations were done by the late, wonderful Trina Schart Hyman. When my children were little, our house was filled with her books. You may see a few more examples here. I first came upon the Bagthorpe Saga when I was a library volunteer shelving books, and I really enjoyed them. I found myself thinking about them lately and decided it was time to read the first in the series again and see if I still felt so fondly toward this eccentric English family. I wasn't disappointed. Ordinary Jack is one of the few books which made this reader feel like a child again, curled up on a window seat or in a big chair. I loved it. I loved the story, the characters, the setting. If there was anything less than nothing, that hound would be it. But there isn't, so we'll have to settle for Zero. The family computers, William and Rosie, had pointed out that mathematically speaking there was a whole lot to choose from that was less than zero, but Mr. Bagthorpe dismissed this as idle speculation. Jack's Uncle Parker, who is married to Celia (a potter, a poet, and a crossword whiz) decides to do something about Jack's lack of distinction in the family. His ideas and their executions are outrageously funny. This is not an 'ordinary' family in any way, and not just because of the various talents. From the grandfather who is S.D. - selectively deaf - to Jack's four year old cousin who has a penchant for starting fires to his grandmother who is obsessed with her dead cat, the characters keep the reader interested and entertained. Helen Cresswell's writing is intelligent, humorous, and so appealing. She was a very prolific author, and you may read a list of her books here. I've asked the library to get me the next one in the series, Absolute Zero, because I want to spend more time with this family. I always wonder if birds reuse nests, and then forget to check in the summer. Maybe this photo will remind me to pay attention!